The parish of Hoveton St Peter is the smaller of two supporting the Broadland village of Hoveton, situated on the northern bank of the River Bure about 7 miles northeast of the city of Norwich. Hoveton, once a small agricultural and river trade settlement, is now a thriving commuter village as well as supporting a busy leisure craft trade. St Peter's parish, somewhat to the north of the village, is, however, a much quieter area with agriculture still dominating the landuse. 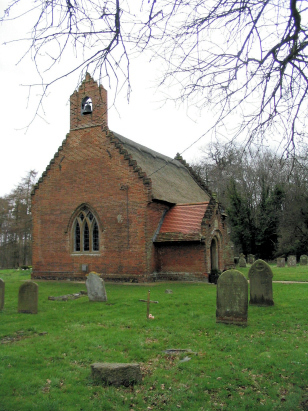 St Peter's church is located on the edge of the grounds of Hoveton Hall, adjacent to a lane which skirts its southern boundary. 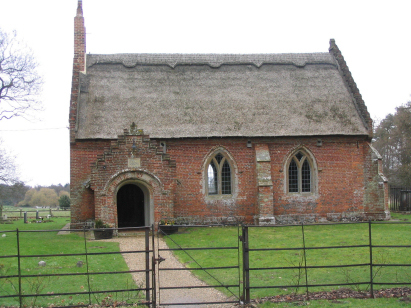 The church is small, as befits a less populated parish, and lacks the characteristic tower of most Norfolk churches. The church is a rarity in that it was built during the 17th century, a time when there were few churches built in England. Even though the church was built in 1625, there were still two substantial renovations by the Victorians and more recently in 1948. The building clearly didn't excite Pevsner as it merits a short description only in his guide. A single standard 800-entry register covers the transcription period and indeed runs onwards through to the latter half of the 20th century. This register is filmed on Microfiche 3 in the collection of the Norfolk Record Office which was used to prepare this transcript. Whilst the fiche is undoubtedly elderly and lacks the clear images of modern filmings it is adequate to the task and this was, therefore, a straightforward transcript to prepare.